Greetings again from the darkness. As recognized at Sundance, this is a commendable debut feature film from writer/director Margaret Betts. It touches on subjects as thought-provoking as traditions in religion, faith, youthful romanticism, and most poignantly, first love. The film is at its best when focusing on the frustration, anger and confusion of both a helpless parent and the teenage girls so full of innocence as they try to come to grips with a decision their maturity level has them incapable of making. Margaret Qualley (“The Leftovers”, and real life daughter of Andie MacDowell) stars as Cathleen, a 17 year old girl whose small town life included parents who divorced when she was younger. Her mother (an excellent Julianne Nicholson) is a foul-mouthed, chain-smoking agnostic who embraced the responsibility of raising Cathleen, even after the father stormed out of their lives. As they stand face-to-face and Cathleen announces she is going to become a nun and proclaims “I’m in love with God”, we all share the parent’s pain as a mother stares back incredulously, knowing full well a 17 year old is incapable of making such a decision on her own. The story follows (at least) three stories: the Reverend Mother, Cathleen and the other nuns, and that of the powerless parent. The setting is the early 1960’s and an ordinance known as Vatican II has just been issued. It was designed to restructure the Catholic Church (for the first time in a century) and have it become more contemporary – allowing the nuns to better serve society. Unfortunately, many of the long-term nuns did not embrace the changes and it rocked their daily routines. Adding salt to their wounds was the fact that the changes were mandated from Rome with no input from the nuns – signaling the beginning of a still-present lack of power for women in the church. This is oh so evident in a scene with the Archbishop (Denis O’Hare) explaining to Reverend Mother how she missed the “subtext” in the suggestions. Most of the film focuses on the group of girls who are shielded from the outside world and its temptations as they go through the rigorous training on the path to solidifying their love of God. What we see is that these girls are simply trying to figure out their own identities as the system works to drain human nature from their souls. The scenes of solitary prayer are powerful as they each wrangle with their beliefs, faith and true self. Typical teenage giddiness is on display as the girls wear their white dresses and veils on the day of vows. Their elation around the campfire is more creepy than comforting. Most painful of all are the “circle of faults” that Reverend Mother subjects the girls to. Morgan Saylor (“Homeland” daughter) plays one of the Sisters and has one of the most gut-wrenching scenes in the film. Most of us have never been through anything close to this and would label it cruel and manipulative. Cathleen’s mother visits when allowed and dutifully shows up for all ceremonies. We can feel her pain as she strives to will some common sense into her daughter – never giving up hope. It’s crucial to note that Ms. Betts does not attempt to take down the church. Rather her story seeks to explore what inspires these young girls to make such a decision, and the emotional turmoil that goes into it. 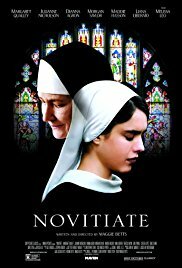 The film kicks off with a narrated “We were women in love”, and ends with a footnote explaining that 90,000 nuns left the convents after Vatican II. If you can connect with the hopeful girls, perhaps the film will have the intended emotional gut punch for which it strives. For the rest of us, we are left with no real explanation, nothing to uplift us, and the crushed spirit of a 40 year devoted nun. On the bright side, the arrival of an exciting, new filmmaker is always worthy of celebration … no need to comfort me. This entry was posted on Thursday, November 9th, 2017 at 6:25 pm and is filed under Drama. You can follow any responses to this entry through the RSS 2.0 feed. You can leave a response, or trackback from your own site.